One new synthesizer which is creating a stir in the world is that of the Korg Volca Keys. This device is a fully functioning synthesizer which can be bought for just over $100 and can be used to create a really cool underground techno sound, as well as many other interesting synthesized sequences and melodies. The Korg Volca Keys comes with an incredibly large and dynamic set of sounds. This device can also be connected with the other called Volca devices and these include a bass synth, a drum machine and a sampler. So what is so great about the Korg Volca Keys and how can it be integrated within a musical setup? Creating sounds with the Korg Volca Keys is relatively simple. The user can switch the device on and after the lights have finished flashing you can begin creating sounds. There are a selection of sound waves which can be switched between, as well as a selection of parameters which can be adjusted and recorded in real time. This means that the individual can quickly begin sculpting sounds by tweaking the wide variety of parameters available. Once the individual has created a sound they can then begin creating sequences which they can build up. A tempo is available and this can be set, which will allow you the ability to key the notes in that you want to play in the sequence. There is also an active step function which allows you the ability to switch on and off certain notes within the 16 step sequence so that you get interesting new patterns from the original. 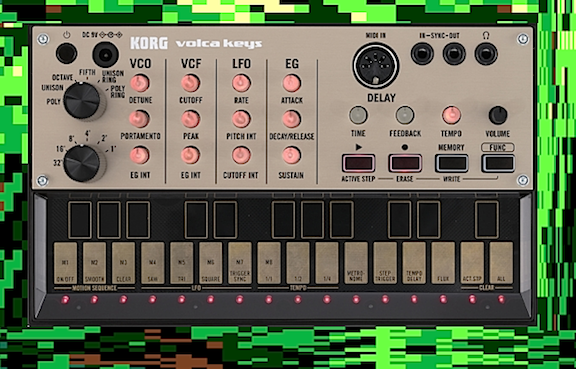 You can easily record the Korg Volca Keys device into a computer and then drag the recordings into a software sequencer. You may then chop the sequence up into individual notes or loop the entire sequence. Maybe you made short loops, or maybe you recorded an entire track, by carrying out live switches between the saved sequences. If you want to integrate the Korg Volca Keys into a software program such as Reason, you can use a program known as Recycle in order to chop up the sequences into individual notes and then either import them as they are, or re sequence them into new interesting melodies and sequences. By using the line input on your laptop and a program such as QuickTime 10 on the Mac, you can begin recording your sequences into high-quality files which can then be dragged into the Recycle program. You can then begin chopping the sequences by adjusting the sensitivity knob at the top left of the user interface within recycle and can also manually putting sliced points.